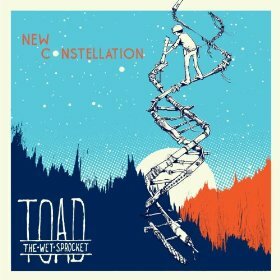 New Constellation is Toad the Wet Sprocket’s sixth studio album, their first album in over fifteen years after 1997’s Coil. The album opens with the title track, “California Wasted,” and “The Moment,” where on the latter of which we hear the band sing, “There is nothing but the moment, don’t you waste it on regret” The band slows it down for “Golden Age” and the sweet “Life is Beautiful.” “The Eye” is a bit corny with its lyrics, but perhaps for that reason it fits into the rest of the album. Overall, this is a very happy record, (they even have a track called “Life is Beautiful”). Personally though, I miss the sounds from albums like Fear and Dulcinea. I suppose I miss the days of wearing flannel when Toad the Wet Sprocket had a less-than-optimistic outlook on life. Still, it’s difficult to get the melodies from New Constellation out of your head.